Last January I took Rob Appell's Color Strata class with my guild. 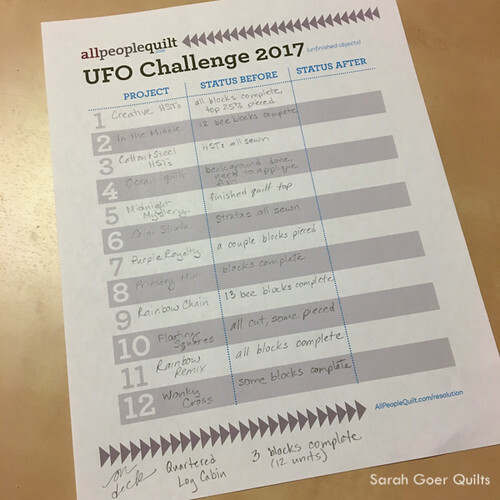 Then the project remained in its project box until I added it to my UFO Challenge sheet in position #6 and it was chosen for January for the APQ UFO Challenge. 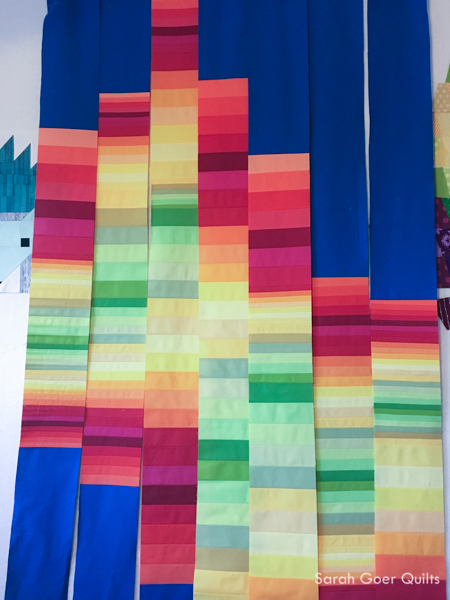 My strata were all pieced in class, using a Kona roll-up of Christa Watson's Designer Palette. This month I've taken it from six pieced panels to a finished (and basted) nearly twin sized quilt top. Quilting is underway, but I wanted to share my January progress. I'm thrilled with how far it's come. And I look forward to finishing it up and submitting it to my guild quilt show. I cut my strata sections into 6 1/2" wide strips (I have a few leftover strips for some future project... it's like my UFO birthed another UFO). 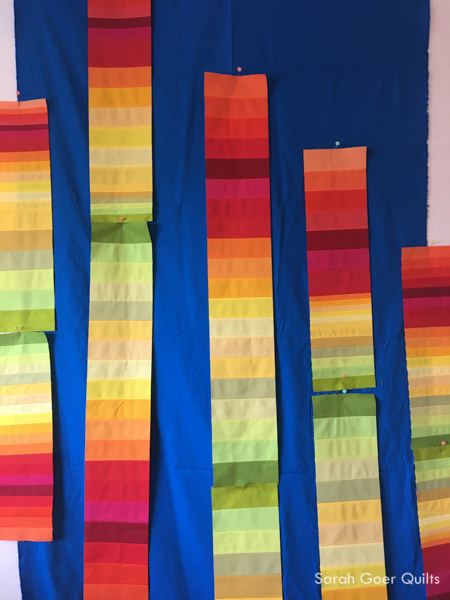 At this point I played with them on my design wall and ultimately decided to use two strips in each column, connecting the green ends. The original strata (see top picture) is built with three different widths of pieces which leads to a variety of sizes in the finished panels. I used this in my design by building out from the longest section in the center. 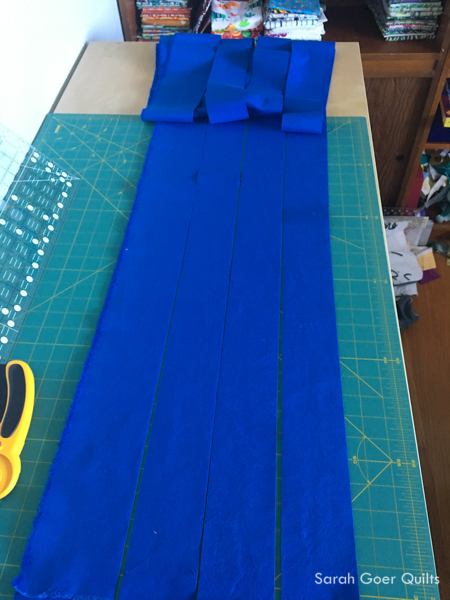 I had originally purchased three yards of the blue fabric for the class. I wish I'd bought more, but I was wary of buying additional fabric from a different dye lot. In the end, the limited amount of blue added to my challenge. I drew out a sketch to scale and then calculated the yardage required for my design. I had to redesign slightly to get it under 3 yards. The redesign simply made the long skinny vertical pieces of blue narrower. 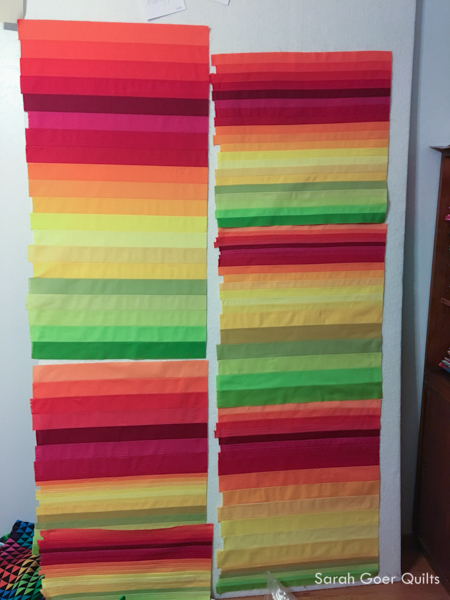 The trickiest part of the project was cutting these 2 3/4" x 95" pieces of fabric! As I worked on piecing my columns, I really liked this intermediate step where all the strata touched. It may inspire a new project to use my leftover bits. The title, No Purple, came from my surprise at how many different colors are in this quilt, yet none of my favorite color. That sure doesn't happen very often. Here's the finished quilt top. The backing is pieced and quilting is underway. I shopped my stash and found these two fabrics to use for the backing. Thank you for visiting! I'm looking forward to seeing which UFO off my list I'll be working on in February. I'm linking up to the January OMG Finish post. Posted in Quilting. 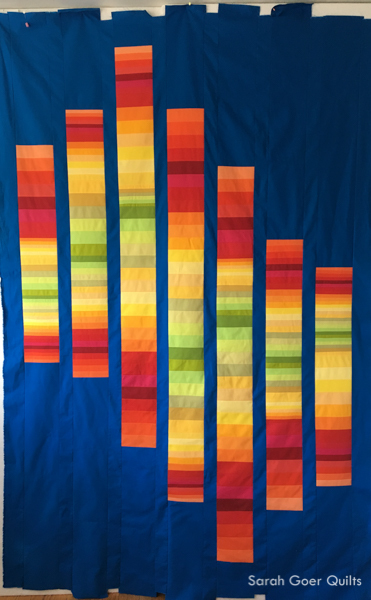 Tags: Color Strata, No Purple, quilt top, throw quilt on January 31, 2017 by sarah. It's been a few months since I've joined in for Color Play Friday. I decided to participate for this Beach Days picture (taken by Sarah at 123 Quilt) because there are so many colors to choose from. We don't see anyone else's palette until the day we all post, so it will be interesting to see what people choose. My palette was chosen from the colors on the chair on the right, with the darker blue coming from the ocean. If you'd like to participate in Color Play Friday you can visit Laurel, Poppy and Pine for the rules. Her post for the week (above) includes the photo for next week's CPF. 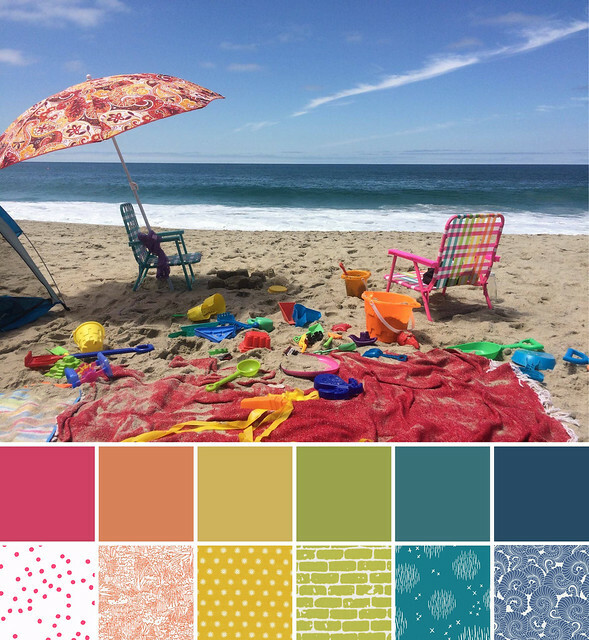 And check out #colorplayfriday on Instagram for past palettes. 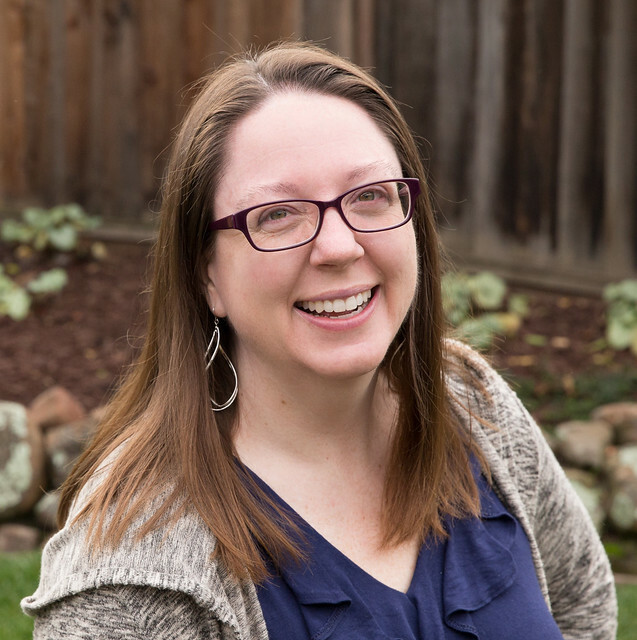 If you'd like to keep up with me and my projects, plus color and design inspiration, please subscribe to my twice monthly newsletter. Posted in Fabric. Tags: Color Play Friday on January 27, 2017 by sarah. In an effort to have more time for other sewing, I'm participating in my last two swaps for the foreseeable future. 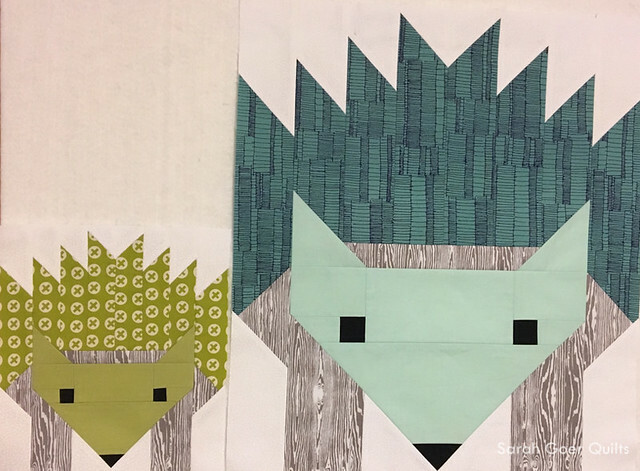 They both come due in February, so I'm chipping away on two mini quilts this month. First, for the Hazel Mania Swap, I've completed two Hazel the Hedgehog blocks. I'll definitely be making more of these cuties! To finish the quilt I just need to fill in the background fabric and add a few special accessories that will personalize it for my secret partner. I look forward to mailing it off to her. Any guesses on the relationship of my two hazels? Issue one of my newsletter will be in your inbox tomorrow. 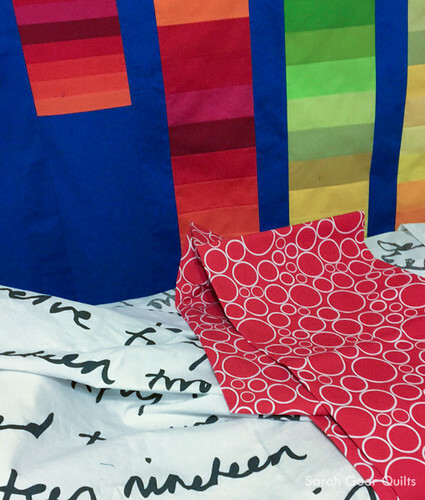 If you're not already a subscriber to my blog, you can subscribe here for creative color and design inspiration and blog updates. Posted in Quilting. 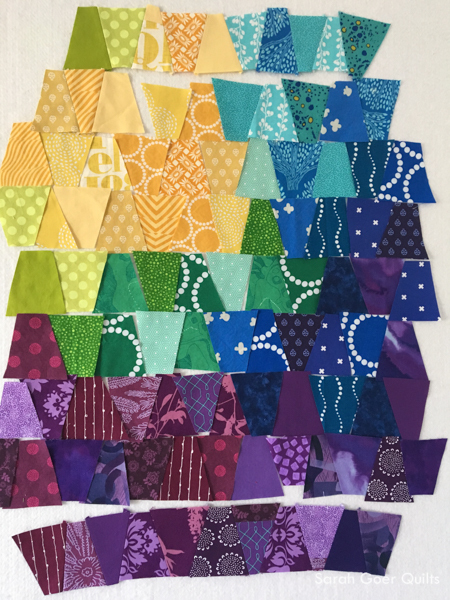 Tags: Hazel Mania Swap, mini quilt, MQG Swap, quilt swap, WIP on January 24, 2017 by sarah.